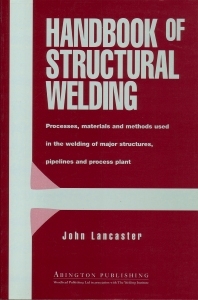 Processes; The metallurgical effects of fusion welding; The behaviour of welds in service; Structures; Pipeline and process plant; The reliability of welded structures and process plant. This handbook provides a comprehensive analysis of the current state of welding technology as applied to large structures and process plant. The author takes account of the increasing necessity for engineers at all levels to be aware of problems such as fatigue failure and provides advice.